Read Graduate Succeed has two components; Elementary and High Schools. The mission of our program is to provide schools with AmeriCorps members to work with and mentor students who have been identified as needing extra help by their classroom teachers and principals. The Elementary portion of the Read Graduate Succeed program provides schools with AmeriCorps members who recruit, train and coordinate volunteers to individually tutor students who have been identified as needing extra help by their classroom teachers and principals. 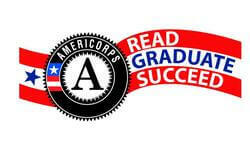 The Read Graduate Succeed high school portion places AmeriCorps members in high schools with their sole responsibility being to increase high school graduation rates and support students’ efforts to engage in post-secondary education. Read Graduate Succeed works to improves the quality of education in Utah Schools. AmeriCorps members will work under the direct on-site supervision of the building level principal or their designee. To work with and meet the academic need of the students as outlined in the policy and procedures manual.